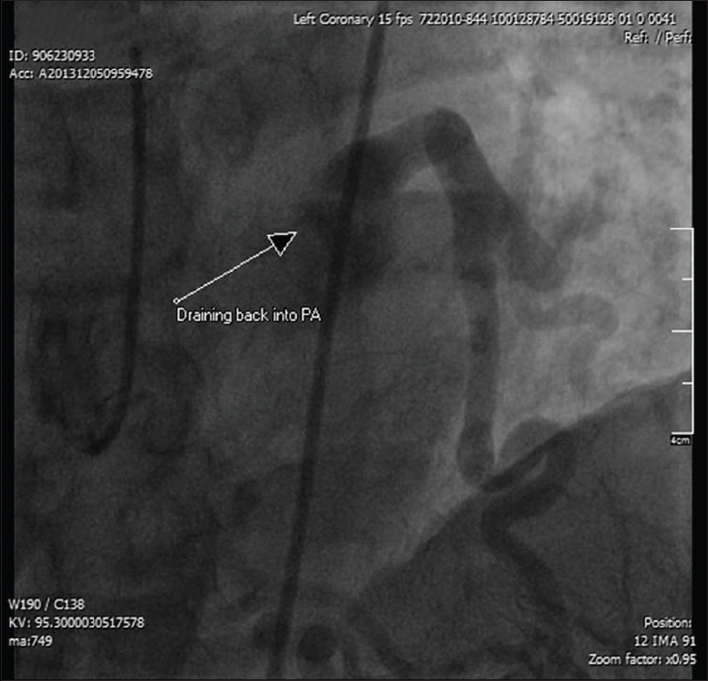 To present a case of a rare congenital coronary anomaly in an adult patient, which was not reported before in Palestine, review the literature, and compare with previously reported cases. Anomalous Left Coronary Artery Arising from Pulmonary Artery (ALCAPA) is a very rare congenital anomaly. Incidence is about 1:300,000 live births.,,,, In a review of pediatric patients who had coronary angiography between 1993 and 2013 at University of Uludag hospital, 22 children (0.9%) were found to have coronary anomalies. While 50% of these anomalies were coronary arteriovevous fistulae, ALCAPA was detected in 36% of them. Congenital coronary artery anomalies are estimated to be detected in 0.6 to 1% of adult patients having coronary angiography. ALCAPA anomaly is extremely rare to be detected during adulthood, furthermore, isolated left anterior descending coronary artery arising from pulmonary artery (ALADAPA) is even much more rare, and is a cause of sudden cardiac death, ischemia and heart failure in adults. A few similar cases have been reported worldwide. Here we report a case of a 63-year-old gentleman who has recently been diagnosed in our center with isolated anomalous left anterior descending (LAD) arising from PA (ALADAPA) and was managed surgically with good outcome. The patient reported is a 63-year-old gentleman who has not been known to have any chronic illnesses in the past. He is a non-smoker with no significant family history for any cardiovascular condition. He was referred to our center in the Cardiology and Cardiac Cath department at European Gaza Hospital (EGH) for coronary angiography as he was complaining from effort intolerance, palpitation, and exertional dyspnea. His physical examination was unremarkable except for a soft apical systolic murmur. Laboratory blood tests values were within normal ranges. Electrocardiography showed non-specific ST-T changes, while his echocardiography revealed mildly dilated LV cavity with borderline systolic function (Ejection Fraction of 50%) and mild to moderate mitral regurgitation. Coronary angiography showed a left main coronary artery that originated from the left sinus of Valsalva of the aortic root, and continued with a big and tortuous obtuse marginal (OM) branch and a small left circumflex artery. The right coronary artery (RCA) was found to originate from the right sinus of Valsalva of the aortic root, and was hugely enlarged and tortuous [Figure 1]. Both big vessels (OM branch and RCA) gave a rich network of collateral vessels that were filling back the LAD artery which, in turn, was significantly dilated, and was draining back into the main pulmonary artery (PA)trunk [Figure 2],[Figure 3], [Figure 4]. The diagnosis of Anomalous Left Anterior Descending coronary artery Arising from Pulmonary Artery (ALADAPA) was established. Coronary multi-slice computed tomography (MSCT) confirmed the anomalous origin of the LAD coronary artery from the pulmonary trunk [Figure 5]. The patient was then referred to the cardiac surgery division at the same hospital. Open heart surgery was planned and performed 2 weeks later, during which the proximal part of the anomalous LAD artery was ligated and the left internal mammary artery (LIMA) was grafted into the distal segment of the artery. 5 days after surgery the patient was discharged in a good condition. Three weeks later, he presented for coronary angiography follow-up that revealed a significant reduction of the collateral vessels with diminished back-flow to the anomalous LAD, LIMA to LAD graft was patent with both antegrade and retrograde filling of the LAD which appeared to be tightly ligated proximally but with residual flow back to the pulmonary artery [Figure 6]. Clinically the patient reported a significant improvement of his symptoms. Anomalous coronary artery arising from the pulmonary artery is a rare but serious congenital cardiac anomaly. Without surgery, around 85% of patients with such an anomaly die before reaching adulthood. Patients usually present in thefirst year of life with signs and symptoms of heart failure or sudden cardiac death. There have been an increasing number of reports of ALCAPA patients surviving to adulthood. Adult survivors might be asymptomatic or present with signs and symptoms of myocardial ischemia, mitral regurgitation, cardiomyopathy, or arrhythmias., This paradoxical situation of a relatively long course of the adult type of ALCAPA anomaly is thought to be related to the complete development of coronary anastomosis (collaterals), allowing the enlarged right coronary flow to perfuse the left myocardium. This adult form is an example of the expected result of the new revascularisation method, growth factors administration therapy, for ischemic heart disease. In our case the presentation was early heart failure symptoms and echo findings with no angina or other significant evidence of ischemia. Isolated anomalous LAD arising from PA is even rarer. In a review by the American Association for thoracic surgery, 10 adult patients were reported to have anomalous coronary from pulmonary artery and were treated surgically between 1960 and 2011. Seven patients had ALCAPA, 2 had Anomalous Right Coronary Arising from Pulmonary Artery (ARCAPA), and only one case reported to have anomalous LAD from PA (ALADAPA). In this anomaly, the LAD territory is at risk of ischemia because of the low perfusion pressure; however, this risk is milder than that found in classic ALCAPA. The circumflex and right coronary arteries are usually enlarged and ectatic giving rich collaterals to the anomalous LAD artery,, 8,  and this was the case in our patient's coronary angiography as well. In spite of the more benign course of ALADAPA anomaly in comparison with classical ALCAPA in adults, the former is still considered a well-known cause of sudden death. In one case report, a 9-year-old, otherwise, healthy boy, complained from dizziness and exhaustion after climbing numerous stairs. He collapsed immediately after. After unsuccessful resuscitation efforts, autopsy indicated an isolated congenital anomaly of LAD coronary origin from the pulmonary trunk. Traditionally, ALCAPA and similar anomalies have been diagnosed by autopsy or coronary angiography; Recently, both cardiac computed tomography (CT) and magnetic resonance imaging (MRI) have allowed noninvasive evaluation of the coronary anatomy and direct visualization of the left coronary artery origin from the pulmonary artery. Echo-Doppler study can help in diagnosis. A predominant systolic flow of the left coronary ostium by Pulsed-wave Doppler is considered characteristic for ALCAPA anomaly. Other possible findings include enlarged right coronary artery trunk and branches, diastolic blood flow signal in the pulmonary artery which can be misdiagnosed as coronary artery fistula, in addition to the possibility of detecting other cardiovascular abnormalities like atrial septum defect, ventricular septal defect and noncompaction of ventricular myocardium. In our patient the diagnosis was established by both the coronary angiography and the multi-slice cardiac computed tomography (MSCT). Surgical correction of this anomaly should be considered before the onset of left ventricular dysfunction. Surgical reimplantation of the anomalous coronary artery onto the aorta is considered the mainstay of treatment. 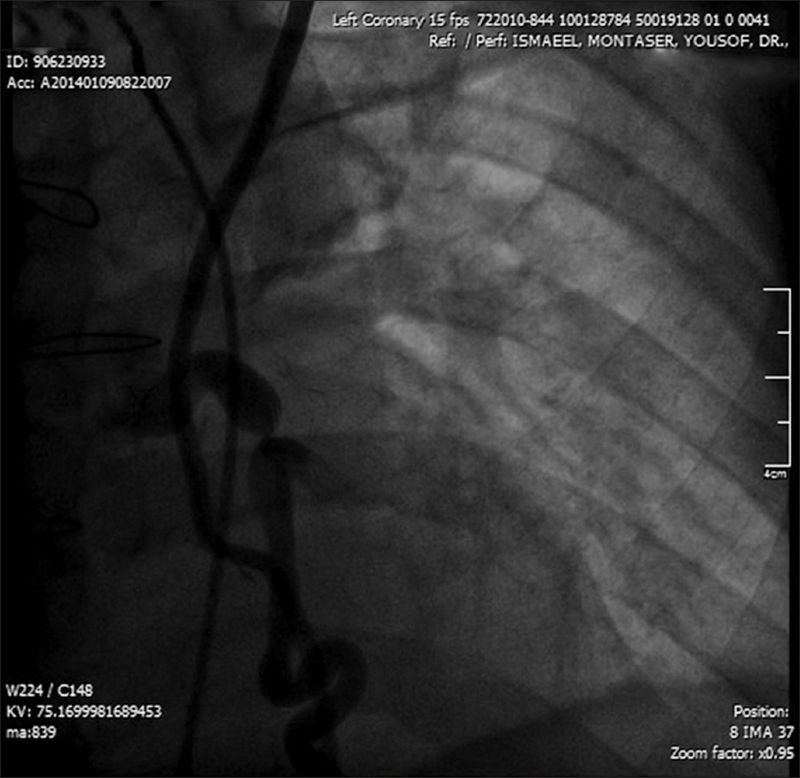 However, proximal ligation of the anomalous artery with coronary bypass grafting is an accepted alternative, but should be reserved for when coronary transfer is not feasible.,, Left internal mammary artery (LIMA) is preferred for such a grafting, this will restore a more physiological antegrade coronary flow to a large area of viable myocardium, it is practical and easy to accomplish. 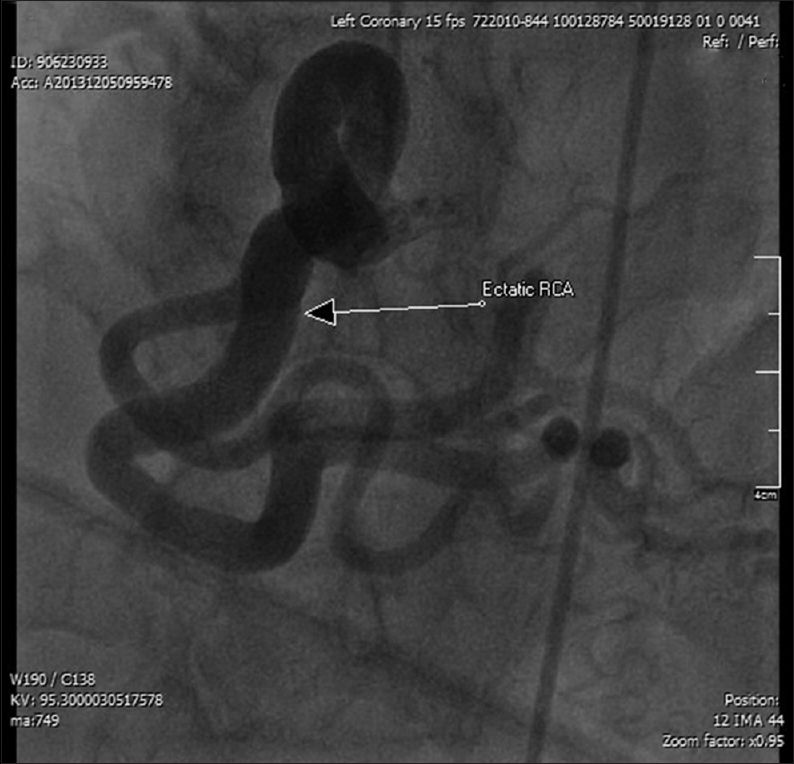 In one case report the anomalous LAD was grafted by a saphenous vein graft, a follow up angiography was done 3 years later, which revealed a patent venous graft, regression of collaterals, and significant attenuation of the distal ectatic RCA and LCX branches. LIMA was grafted distally to the proximally ligated anomalous LAD in our patient, with good clinical outcome. Anomalous LAD coronary artery arising from pulmonary artery (ALADAPA) is an extremely rare congenital anomaly that coud be discovered during adulthood (beyond age of 60 as in our case). Both invasive coronary angiography and non-invasive coronary MSCT are the main diagnostic methods. Surgical ligation of the anomalous vessel with coronary grafting can lead to significant clinical improvement. Krexi L, Sheppard MN. Anomalous origin of the left coronary artery from the pulmonary artery (ALCAPA), a forgotten congenital cause of sudden death in the adult. Cardiovasc Pathol 2013;22:294-7. Keith JD. The anomalous origin of the left coronary artery from the pulmonary artery. Br Heart J 1959;21:149-61. Yamanaka O, Hobbs RE. Coronary artery anomalies in 126,595 patients undergoing coronary arteriography. Cathet Cardiovasc Diagn1990;21:28-40. Hauser M. Congenital anomalies of the coronary arteries. Heart 2005;91:1240-5. Frescura C, Basso C, Thiene G, Corrado D, Pennelli T, Angelini A, et al. Anomalous origin of coronary arteries and risk of sudden death: A study based on an autopsy population of congenital heart disease. Hum Pathol 1998;29:689-95. Uysal F, Bostan OM, Semizel E, Signak IS, Asut E, Cil E. Congenital anomalies of coronary arteries in children: The evaluation of 22 patients. Pediatr Cardiol 2014;35:778-84. Ozer N, Deniz A, Doğan R. Left anterior descending coroPnary artery originating from the pulmonary artery: A rarity suspected during echocardiography. Türk Kardiyol Dern Arş 2008;36:181-3. Pringle TH, Ockene IS, Howe JP 3rd, Cutler BS, Vander Salm TJ. Origin of the left anterior descending coronary artery from the pulmonary artery: An unusual cause of angina in a middle-aged woman. Cardiovasc Dis 1980;7:302-6. Quah JX, Hofmeyr L, Haqqani H, Clarke A, Rahman A, Pohlner P, et al. 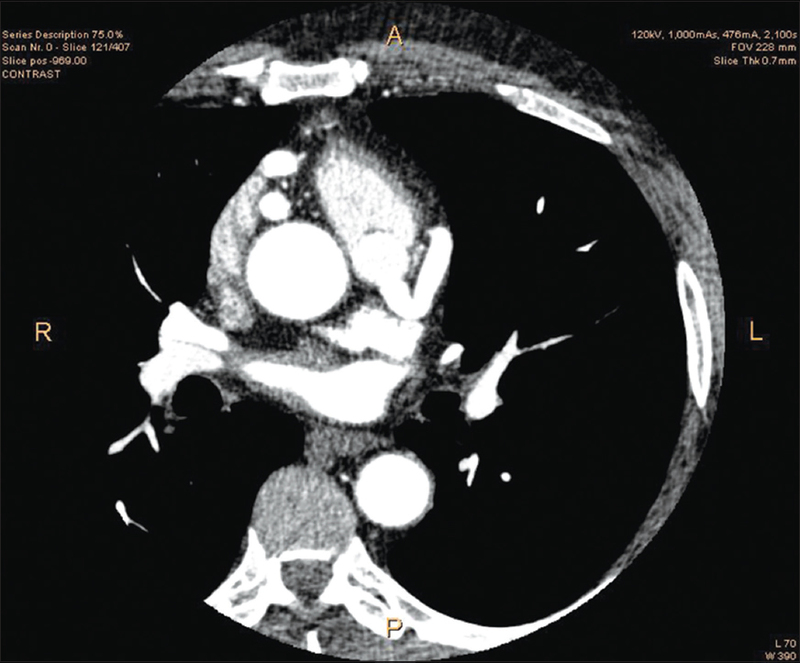 The management of the older adult patient with anomalous left coronary artery from the pulmonary artery syndrome: A presentation of two cases and review of the literature. Congenit Heart Dis 2013. Dionne PO, Poirier N, Forcillo J, Stevens LM, Chartrand-Lefebvre C, Mansour S, et al. 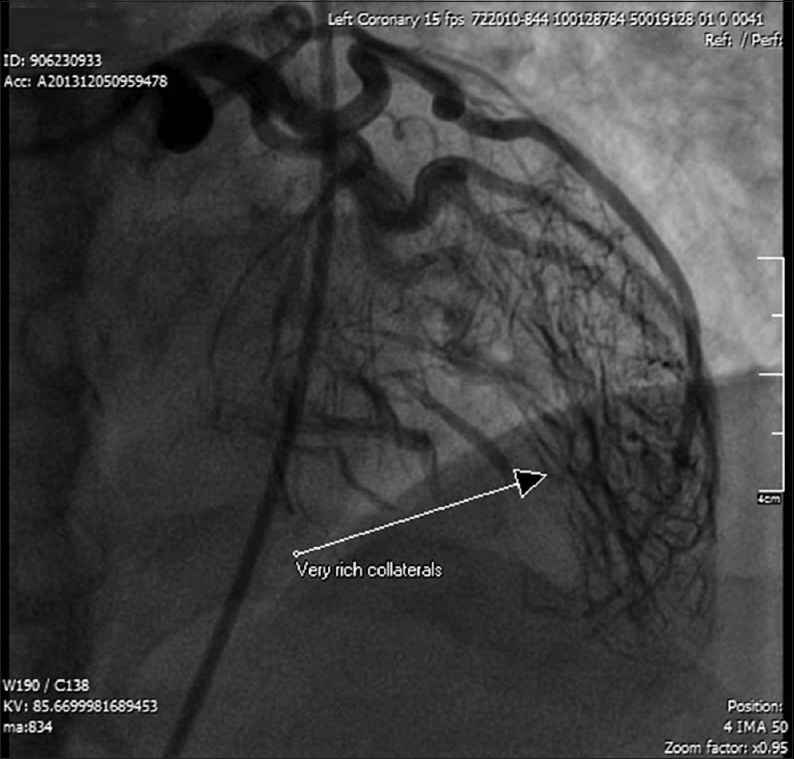 A rare case of anomalous origin of the left main coronary artery in an adult patient. J Cardiothorac Surg 2013;8:15. Sorodoc L, Păduraru D, Filipoiu F, Sorodoc AN, Păduraru L. White-bland-garland syndrome: The maximum natural development of the coronary anastomosis (II). Rev Med Chir Soc Med Nat Iasi 2001;105:677-81. Rajbanshi BG, Burkhart HM, Schaff HV, Daly RC, Phillips SD, Dearani JA. Surgical strategies for anomalous origin of coronary artery from pulmonary artery in adults. J Thorac Cardiovasc Surg 2013: S0022-5223 (13) 00946-X. Derrick MJ, Moreno-Cabral RJ. Anomalous origin of the left anterior descending artery from the pulmonary artery. J Card Surg 1991;6:24-8. Subban V, Jeyaram B, Sankardas MA. Anomalous origin of the left anterior descending artery from the pulmonary artery. Heart 2010;96:170. Evans JJ, Phillips JF. Origin of the left anterior descending coronary artery from the pulmonary artery. 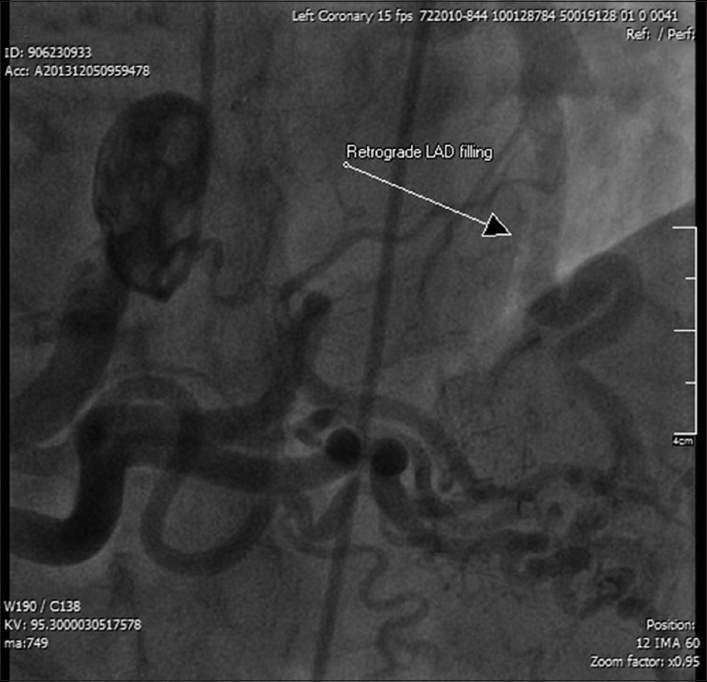 3 year angiographic follow-up after saphenous vein bypass graft and proximal ligation. J Am Coll Cardiol 1984;3:219-24. Morentin B, Peciña T, Aguilera B. Sudden death due to an anomalous origin of the left anterior descending coronary artery from the pulmonary trunk in a 9-year-old boy. Rev Esp Cardiol 2000;53:294-6. Oncel G, Oncel D. Anomalous Origin of the Left Coronary Artery from the Pulmonary Artery: Diagnosis with CT Angiography. J Clin Imaging Sci 2013;3:4. Ghaderi F, Gholoobi A, Moeinipour A. Unique echocardiographic markers of anomalous origin of the left coronary artery from the pulmonary artery (ALCAPA) in the adult. Echocardiography 2013;31:E13-5. Kong LQ, Zhang L, Feng Y, Kang Y, Wang F, Tang H. Echocardiographic features of patients with anomalous left coronary artery from the pulmonary artery. Zhonghua Xin Xue Guan Bing Za Zhi 2013;41:297-300. Kale SB, Raghavan J. Use of the internal mammary artery to graft an anomalous left main coronary artery in an adult. J Card Surg 2012;27:325-7.